A reporter fusion is the hybrid of a gene or portion of a gene with a tractable marker. 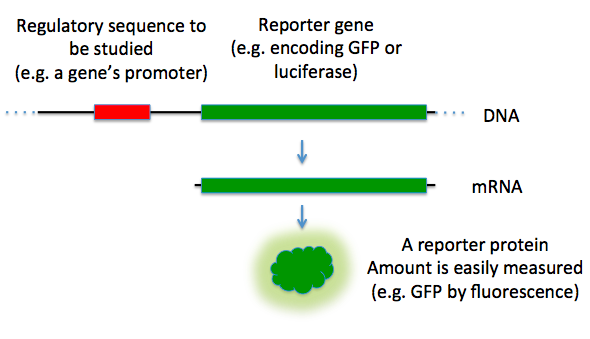 A reporter construct allows the study of gene ‘s function and localization of a gene product. The promoter reporter constructs allow a protein to be expressed under the control of a target gene. Reporter fusions can fuse a protein of interest to a protein with a property of interest, therefore allowing the tagged protein to be further studied. substrate analog: Substrate analogs (substrate state analogues), are chemical compounds with a chemical structure that resemble the substrate molecule in an enzyme-catalyzed chemical reaction. luminescent: Emitting light by luminescence. In molecular biology, a reporter gene (often simply reporter) is a gene that researchers attach to a regulatory sequence of another gene of interest in bacteria, cell culture, animals, or plants. Certain genes are chosen as reporters because the characteristics they confer on organisms expressing them are easily identified and measured, or because they are selectable markers. Reporter genes are often used as an indication of whether a certain gene has been taken up by or expressed in the cell or organism population. To introduce a reporter gene into an organism, scientists place the reporter gene and the gene of interest in the same DNA construct to be inserted into the cell or organism. For bacteria or prokaryotic cells in culture, this is usually in the form of a circular DNA molecule called a plasmid. It is important to use a reporter gene that is not natively expressed in the cell or organism under study, since the expression of the reporter is being used as a marker for successful uptake of the gene of interest. Commonly used reporter genes that induce visually identifiable characteristics usually involve fluorescent and luminescent proteins. Examples include the gene that encodes jellyfish green fluorescent protein (GFP), which causes cells that express it to glow green under blue light, the enzyme luciferase, which catalyzes a reaction with luciferin to produce light, and the red fluorescent protein from the gene dsRed. A common reporter in bacteria is the E. coli lacZ gene, which encodes the protein beta-galactosidase. This enzyme causes bacteria expressing the gene to appear blue when grown on a medium that contains the substrate analog X-gal. An example of a selectable-marker which is also a reporter in bacteria is the chloramphenicol acetyltransferase (CAT) gene, which confers resistance to the antibiotic chloramphenicol. Reporter genes can also be used to assay for the expression of the gene of interest, which may produce a protein that has little obvious or immediate effect on the cell culture or organism. In these cases the reporter is directly attached to the gene of interest to create a gene fusion. The two genes are under the same promoter elements and are transcribed into a single messenger RNA molecule. The mRNA is then translated into protein. 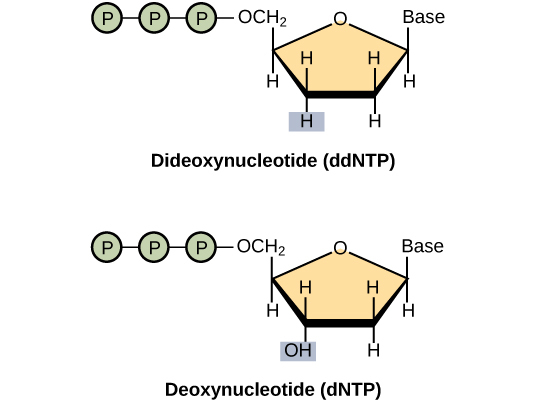 In these cases it is important that both proteins be able to properly fold into their active conformations and interact with their substrates despite being fused. In building the DNA construct, a segment of DNA coding for a flexible polypeptide linker region is usually included so that the reporter and the gene product will only minimally interfere with one another. This is often done with GFP. The resulting protein-GFP hybrid transcribed from the reporter construct now has a protein attached to GFP. In the case of GFP which fluorescence one can deduce that the attached protein is wherever the fluorescence is. This allows a researched to determine where in a cell a protein may be localized in a cell. Streptococci: Light microscopy view of streptococci, a non-sporulating lactic acid bacteria. GFP fusion proteins: A human mesenchymal stem cell. 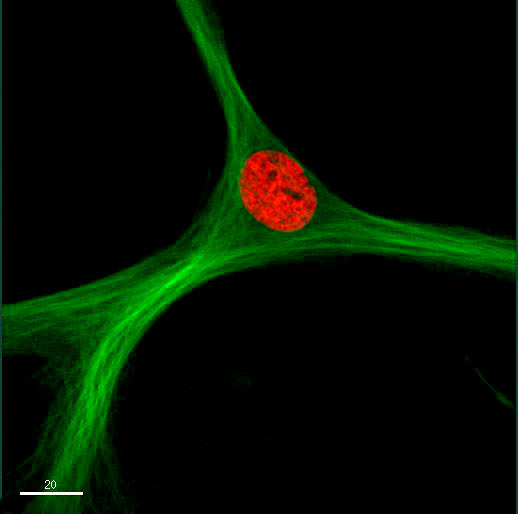 In this cell a microtubule protein is fused to GFP (green) while a histone protein is fused to RFP (red). As you can see the localization of the fused protein can now be determined using fluorescent reporter fusions.